Throughout history, everyone has come to the Algarve on the sunny southern tip of Portugal, facing the Atlantic to the west and south. It's just that kind of irresistible spot. The Algarve is history's guest book. Everyone came here to bask in the sun: Neanderthals, Paleolithic cave-painters, seafaring Phoenicians, Imperial Romans, philosophical Moors from North Africa, princely Castilians from neighboring Spain, and piratical Brits. Tourists discovered the Algarve in the Victorian era of the late 1800s, and Algarve vacations became a tradition for many Europeans. The Algarve's unique hospitality impresses even that most demanding luxury travelers. Service is unpretentious, nonjudgmental, and sincerely welcoming. Your treatment at even a modest establishment is as gracious as ​five-star hotel service. The best way for North Americans to visit the Algarve is via TAP, Portugal’s national airline. Portugal's capital, Lisbon, is a seven-hour flight from North America's East Coast. From there you can hop a short flight to Faro (the Algarve’s main airport) or rent a car for the easy 2 ½ hour drive down the coast. The Algarve's endless coastline is lined with enchanting beaches. Many visitors check out several and decide on their favorite patch of sand. Beaches are spotless and wide, with white-powder sand. Boat rides and rentals are easily had in the Algarve's many marinas. The Algarve's beaches are not Mediterranean but Atlantic. The sapphire water is fresh, lively, and warmed by ocean currents. Praia (Beach) do Benagil is world-famous for its amazing caves (above) created by eons of waves. The Algarve has not been denatured by cookie-cutter beach hotels. Here you have a vast choice of lodgings: historic pousadas (inns), traditional manor houses, seaside villas, and (yes) some stylish contemporary hotels. No matter their type, Algarve hotels are likely to win you over with their charm and professionalism. Algarve hotels featured here on TripSavvy: a count's castle now a pousada inn, with notable azulejo mosaics and a dreamy pool, Pousada Palacio de Estoi; a serene oceanfront boutique hotel with a Michelin-honored restaurant, Vila Joya; a vibrant town's beach mansion decorated by Portugal's top designers, Bela Vista. a swimming pool (sometimes indoors as well as outdoor); a sophisticated spa (even if it's petite); fast wifi connections; (I'll say it again) great service, from servers and maids to concierges and managers. The Algarve is a paradise for travelers who love seafood and the Mediterranean diet. The freshness of the local fish and seafood is unsurpassed. Simplicity reigns with just a dash of lemon and the finest olive oil. (With this quality, who needs sauce?) The flavor of the local produce is superlative, too. Just try the local oranges. And there's high-end dining here on the Algarve. Local chefs have trained in some of the world's top dining establishments. Presently there are three one-star and two two-star Michelin restaurants in the region, like the restaurant at Vila Joya. The Algarve's Moorish heritage pervades this richly historic part of Iberia. Culturally advanced Moors, from North Africa, swept across vast areas southern Iberia beginning in 711. The very name Algarve comes from the Arabic al-gharb, meaning "west" (the Moors' stronghold was Spain, east of here). 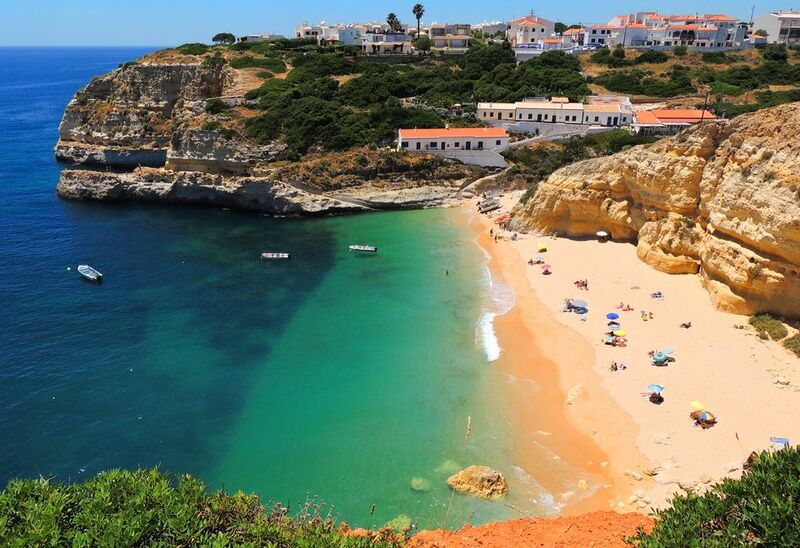 The Moors founded Al-uhera, now called Albufeira, the Algarve's top vacation spot. The Moors' coastal capital of Xelb (now called Silves) challenged the dominance of the old Roman capital in what is now Lisbon. Silves Castle, built in the 1200s, is the Algarve's best-preserved and most historically significant Moorish palace. The Algarve entertains visitors year-round with celebrations of local culture and cuisine. The Festival of the Chouriças (sausages) in Querencia spices things up in January. The musical Festival of the Janeiras refers to Roman times, when citizens would bless the god Jane (Janus) when entering or leaving their houses. The May Fair in Azinhal spotlights traditional artisan skills of the Algarve: lacemaking, embroidery, tapestry, basketwork. The International Motorbike Festival rolls into Faro in July. See the Algarve's annual festival calendar. The Algarve is now one of Europe's premier golf destinations with a total of 42 courses. Penina, a championship course, was designed by Henry Cotton in 1966 as the first golf course in the Algarve. Other top courses include Monte Rei, Oceanico, San Lorenzo, and Quinta do Lago (designed by American William Mitchell). The Pine Cliffs at the Sheraton Algarve features an academy with cool new tech. See some Algarve golf resources.